There’s Decay Under My Crown, Now What? A crown is an excellent way to restore a tooth that has been severely damaged. It provides a cap-like covering for all visible surfaces of your tooth. Although the crown itself cannot develop decay, the underlying tooth and root structures are still vulnerable to cavities. Once decay forms, it can progress quickly and migrate under the crown, which compromises the function of your dental restoration. If your dentist detects decay under your crown, there are a number of possible treatments depending on your unique situation and the severity of the decay. If the cavity was caught at an early stage, a simple dental filling can be placed at the margin of the dental crown. However, the area will need to be monitored closely because the seal of a filling is not as strong and could possibly leak over time. If the decay reached the nerve center of your tooth, a root canal will be needed to save your tooth. 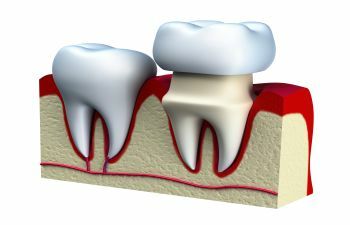 For a tooth that has already undergone a root canal, it will need to be built back up and a new crown should be placed. This procedure involves the surgical removal of bone to allow the dentist access to an area of decay along the side of your tooth. After your tooth is restored properly, a new crown will be needed. In the majority of situations, a new crown will be fabricated in order to properly seal and cover your tooth after decay. Dental crowns are meant to last anywhere from 5 to 15 years. However, they are not invincible to decay and they need proper care. Regular checkups allow Dr. Morris to examine the health of your crown, check for decay and evaluate any crown edges that may be leaking.